Nestled in the woods along the Delaware River, this cozy cabin features both the quiet seclusion of the woods and the recreation of the Delaware River. Home to skiers, hikers, kayakers, mountain bikers, fly fishers, hunters and naturalists, the cabin is perfect for the family who loves nature or the writer/artist looking for retreat. 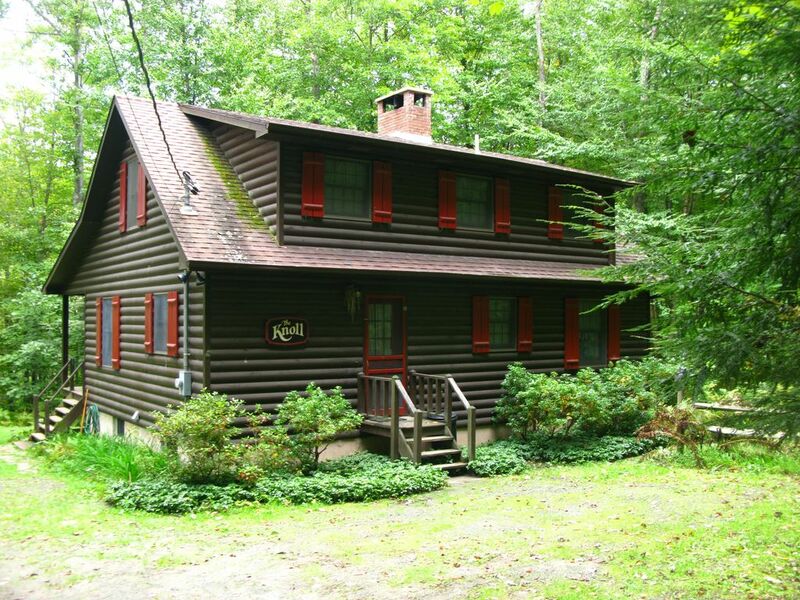 This charming cabin is surrounded with woods and streams providing privacy and over 300 ft. of river frontage. Beautiful paths and foot bridges lead from the house to the river. Many bald eagles nest in the area. It is in perfect condition with a wood burning fireplace, finished basement with a wood burning stove and a porch looking out to the river. The cabin is on the PA side, 2 miles south of the quaint town of Narrowsburg, NY. A haven to experience, this cabin on the Delaware River guarantees a relaxing and peaceful atmosphere during every season of the year. Surrounding Area: Many of our visitors have told us they enjoy simply staying at the cabin, reading, birdwatching and exploring the river and forest. But if you want to venture farther out, two miles north of the cabin lies the quaint town of Narrowsburg, NY. Browse the local art and antique galleries. Experience the Tusten Theatre. Relive history with a visit to Fort Delaware. Or take a drive along the beautiful winding roads which parallel the river. Down stream is the historic Zane Grey House. 30 minutes to Honesdale to stroll the streets or ride the Stourbridge Rail, a steam engine journey to the wild west. Ski Area: 20 minute drive to a choice of two ski slopes, Tanglewood or Big Bear. There are great cross-country ski trails in Promise Land State Park, 30 minutes from the cabin. The River: This area of the river boasts of some of the most exciting and varied water on the Delaware River. North of the cabin runs Skinners Falls, a challenging section of rapids. Then the water flows into Narrowsburg over the deepest water in the river. On the stretch of river between Narrowsburg and the cabin, there are rocks and cliffs from which to jump into the river. Further down the river are more rapids and eventually the highest and fastest water on the Delaware. Tubes, canoes and kayaks are available at the house and more to rent from local outfitters. The cabin sits on 300 feet of river front property. All beds are made with clean, crisp linens. Plenty of towels provided in the bathrooms. A wood stove in the basement provides atmosphere and warmth. A spotless kitchen with coffee grinder and coffee maker. Dishes, pots and pans provided. A porch lined with rocking chairs looks through the woods toward the river. The cabin is well equipped for winter and summer. The wood ring on the porch is loaded with split wood and kindling for warm, cozy fires in the living room fire place. Tubes, kayaks and canoes are available with life jackets. The kitchen keeps coffee, tea and hot chocolate stocked for guests. Jigsaw puzzles, brain teasers, games and toys line the toy chest. A wonderland for children, a tree house sits between two trees. A rope swing straddles the stream below the tree house. The river in the summer has a gentle current and is shallow with a gradual depth to adult waist in the middle of the river. The NY side of the river can be 6-7 ft deep with a stronger current. Bald eagles, beaver, deer, turkeys, porcupine and other animals have all been spotted around the cabin. We stayed at the Knoll in February and we were so pleased with the cabin. Set in the most picturesque location and easy to find. Everything you need is available. We played games and read and took some wonderful hikes around the area. We saw dear and bald eagles across the water. We hope to come back with the warmer weather. Thank you for sharing your beautiful home with us. I loved the scenery around the house. The beautiful deck looking down the river and all the little creeks around it. I image in the summer how amazing it looks. The house inside was very spacious and homey. The fireplace in the living room was amazing. The kitchen was big and able to cook anything you wanted. The house has thousands of games to play which was so nice since we only had two of our own. It was my birthday weekend getaway with my girls and everyone loved it. We totally loved the place, not quite as secluded as we thought but still a great place. Beautiful views of the river from the deck, fall foliage on the mountain across from the deck was awesome especially when the morning sun shined on the mountain. This place I so gorgeous and quiet! We wanted to get away from everything and this was perfect. The property is absolutely amazing and we are talking about when (not if) we will go back. Fall is an excellent time to visit the Knoll. We pick the time of year in hopes of catching the autumn at its peak. We were not disappointed. The trees were beautiful and so was the cabin. It particularly was somewhat private with the peaceful surrounding of mother nature. Our daily views were of the forest and the sound of the trickling creek, at night, (helped us fall to sleep). The Delaware River was just a short walk from the cabin and very accessible. Unfortunately, the fall brisk temperature prevented us from using the kayaks and this was disappointing, but certainly didn't dampen our moods or enjoyment. We enjoyed the areas hiking trails, winery, shopping and eating (Heron - excellent dinner) in the surrounding towns. Our evenings were spent in front of the fireplace and enjoy the mood. It was a plus not having a t.v. interfering with our socializing and atmosphere of this romantic cabin. A cozy cabin with a great porch and fire pit and wonderful platform over the Delaware River. It is comfortable, well appointed, and in a beautiful location. The bunk beds are at the top of the stairs (so there's no door). All bedrooms are upstairs on the second floor, with the two full bathrooms on the first floor and in the basement. The Delaware River is right in front of you for fishing, kayaking and canoeing, swimming, bird watching hosting many bald eagles, seen especially well in winter! The river water is clean and wonderful to swim and fish. This is prime area for fishing and hunting! This part of the river boasts of some of the best trout/fly fishing in the world. There is a tandem kayak, a single kayak, and a canoe under the porch. Paddles and life jackets are in the pantry closet off the kitchen. There are hiking trails all through the woods surrounding the cabin. Two miles north of the cabin lay the quaint town of Narrowsburg, NY. Browse the local art and antique galleries. Experience the Tusten Theatre. Relive history with a visit to Fort Delaware. There is an organic farm nearby that sells fantastic vegetables and fresh meats as well as providing the kids an opportunity to see chickens and lambs. Events like the Callicoon Tractor Parade, the Narrowsburg Eagle Fest, farmer's markets and celebrations for every major holiday provide local flavor. Down stream is the historic Zane Grey House. A 30 minute drive west will bring you into Honesdale. Stroll the streets or ride the Stourbridge Rail, a steam engine journey to the wild west. Bethel Woods Performing Arts Center, built on the site of the original Woodstock, has amazing concerts in an outdoor venue, www.bethelwoodscenter.org. On a rainy day visit their Woodstock museum that is state of the art. One of the top resorts/spas in the country is located 20 minutes from the cabin. Prime area for motorcycle enthusiasts. Ski Area: a choice of several ski slopes. Camelback Ski- Camelback has 33 trails and 17 lifts making this a blast for the whole family. Skiing, Snowboarding, Tubing. Approximately 45 minutes from the Knoll. 570-629-1661. Ski and Snowboarding Slopes are a 20 minute drive.